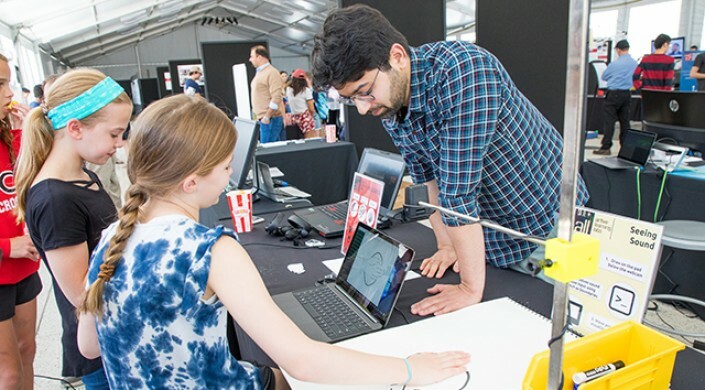 The Harvard Science Center Plaza was bursting with technology and innovation during the John A. Paulson School of Engineering and Applied Sciences (SEAS) Design and Project Fair. The culminating annual event, held on May 2, showcased the course, club, and individual work of students from the past year. One corner of the plaza tent featured proud students displaying posters of their data driven research from various computer science courses. In another corner, robots designed by the Harvard Undergraduate Robotics Club (HURC) were walking among spectators who were interacting with demonstrations by the Active Learning Labs. As visitors moved through the tent, they witnessed the breadth, depth, and creativity of student engineers. The SEAS Racing Team is designing an ultra-efficient vehicle. During the Design and Project Fair on May 2, freshman Joseph Sanchez shared the objectives of the design: “We have to compete in a 9.6 mile race using the minimum possible amount of fuel.” Over the course of the past three years, students on the team have built an engine, chassis, and steering system. They used simulations in Matlab specific to their engine design to estimate the car’s efficiency. “It’s been really fun getting to work with carbon fiber,” Sanchez added. Students on the racing team applied a wide range of engineering skills, while acquiring many new ones, in building the vehicle. SEAS is going to space. Robert Anderson, S.B. ’19, a mechanical engineering concentrator, shows off the HURC six-legged Mars Rover to visiting students Peyton Mascarimas and Cassie Jessen. Anderson, project manager of the build, and a team of SEAS students have been constructing the rover since the fall to compete in an international design competition in June. Its intricate design includes a carbon fiber body and arm, and 3D-printed leg pieces to keep the rover as strong yet as light as possible. Recently, the students added stronger motors and a new carbon fiber case to keep sand and dust out of the operational parts, Anderson explained. “The most challenging aspect of the project was designing the electrical components and controls, particularly writing the algorithms to control the rover’s motors and to maneuver the robot remotely,” he said. Freshmen Cecil Myers, Jack Daley, and Jack Swisher, students in Introduction to Environmental Engineering (ES 6) show off their poster presentation on “Greenscaping the Science Center Plaza.” The final project for the course was fairly open-ended. While some students did experiment-driven work, others, like this group, chose to take a more design and finance approach. They measured the UV exposure and air quality around Harvard’s Science Center Plaza, and used software modeling to calculate the cost-benefit analysis of planting 24 new trees around the area. “This area is sitting right on top of a tunnel. With rain it gets quite damp, so having a roots system would help,” explained Daley. Amy Li, A.B. ’20 an environmental science and public policy concentrator, along with classmates Leticia Ortega, S.B. ’19, an environmental science and engineering concentrator, and Ethan Wong, S.B. ’19, a mechanical engineering concentrator, display their hydroponic aquaponic water filtration system. After taking Water Engineering (ES 165) in the fall, Li decided to continue developing her group’s final project. After receiving a grant from Harvard’s Office for Sustainability, she has experimented in the Active Learning Labs to grow plants without soil. “Our work will be useful for growing crops in environments with water-poor or nutrient-poor soil,” Li explained.